Walters, Monroe F. (1867-1948), was born on November 3,1867, son of Monroe and Isabella Walters. He only attended school up to the 8th grade. He lived at Goshen Bridge, Virginia, then at Low Moor, Virginia, and later Clifton Virginia. He later on returned to Ohio and resided at 1358 North 5th Street Columbus, Ohio. He was originally from Logan, Ohio, where he worked as a sales clerk in the coal mining industry for the Columbus and Hocking Coal and Iron Company (C & H. C & I. Co.) store, and later on at their plant in Longstreth, Ohio. On November 14, 1887 he married Lillie "Lillian" M. Turner, at Gallia, Ohio. They had a son Louis Walters (1892-). He and his family moved to Goshen, Virginia on February 2, 1889, where he worked as a sales clerk in the Victoria Furnace store. His name appeared in the March 1892 issue of The Numismatist, in list no. 15, as number 442. Fig. 1. Letter sent by Monroe F. Walters to the Chapman Brothers for the Thomas Ramsden sale held on June 21-22, 1892, postmarked at Goshen Bridge, Virginia, June 10, 1892 (very scarce). Postal Stationery - Thorp-Bartels No. 1298, Plimpton Envelope, Die No. 5, Watermark No. 8, Knife No. 50. Courtesy the Lupia Numismatic Library, Special Collection, The Chapman Family Archive. By 1893 he worked for the Virginia Iron & Railway Company at Goshen Bridge (see Fig. 2). He was a correspondent with the Chapman Brothers and placed bids in their auctions. The Lupia Numismatic Library contains various letters from him to the Chapman Brothers about coin auction sales. Fig. 2. 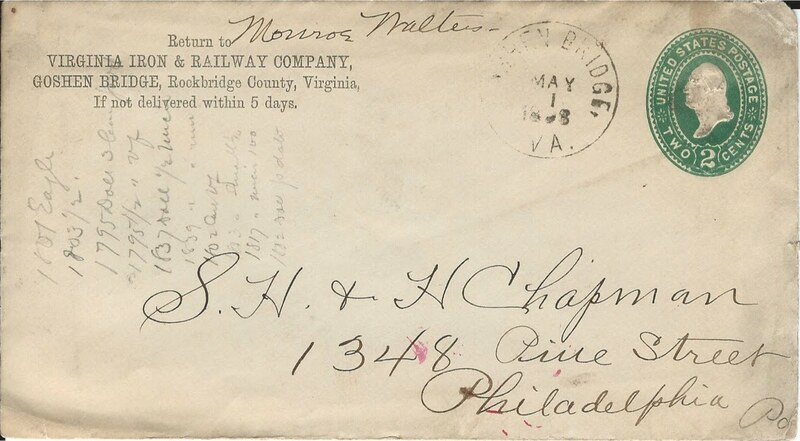 Letter sent by Monroe F. Walters to the Chapman Brothers postmarked at Goshen Bridge, Virginia, May 1, 1893 (very scarce). Postal Stationery - Thorp-Bartels No. 1298, Plimpton Envelope, Die No. 5, Watermark No. 8, Knife No. 50. Note the ten coin lots he is bidding on in the Nicholas Petry sale to commence on May 10, 1893 : (1) 1801 Eagle [Lot 308]; (2) 1803 1/2 Eagle [Lot 310]; (3) 1795 Doll. 3 leaves [Lot 334]; (4) 1795 1/2 Doll. VF [Lot 375 listed as Extremely Fine]; (5) 1837 Doll 1/2 Unc. [Lot 434]; (6) 1839 Doll 1/2 Unc. [Lots 436]; (7) 1802 Cent VF [Lot 625]; (8) 1803 Cent small 1/100 [Lot 626]; (9) 1817 Cent Uncirculated 100 [Lot 639]; (10) 1802 Doll. p[erfect] date [Lots 350 or 351]. Courtesy the Lupia Numismatic Library, Special Collection, The Chapman Family Archive. Fig. 3. 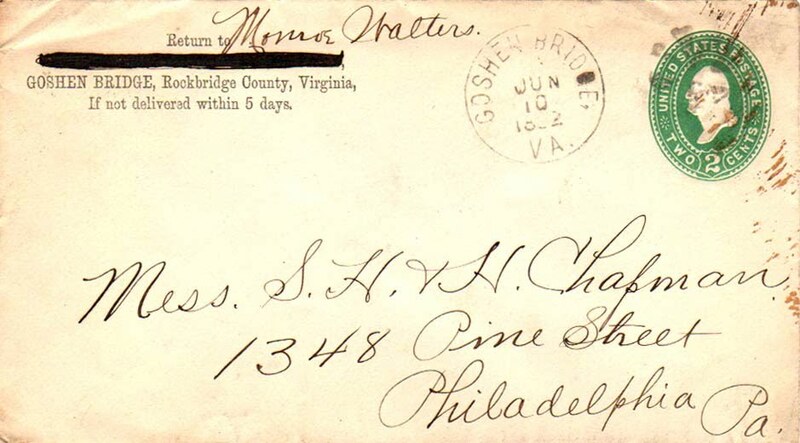 Letter sent by Monroe F. Walters to the Chapman Brothers postmarked at Goshen Bridge, Virginia, May 1, 1893. Note the Chapman Brothers misidentified Walters as Walker, below "Bids Petry Sale". They note in red ink the order for the Priced Catalogue in the letter below, here seen as PC with a small Sigma. Below that also in red ink "27 oak E (Greek letter Sigma)" which is a Chapman code identifying the bidder and the underlined Sigma signifying they mailed him an invoice for the total amount due since the Sigma was an accounting symbol for Total Amount. The Chapman annotation "ans[wered] 5/27/93" most probably the date the Chapman's mailed the invoice for the auction winning bids. 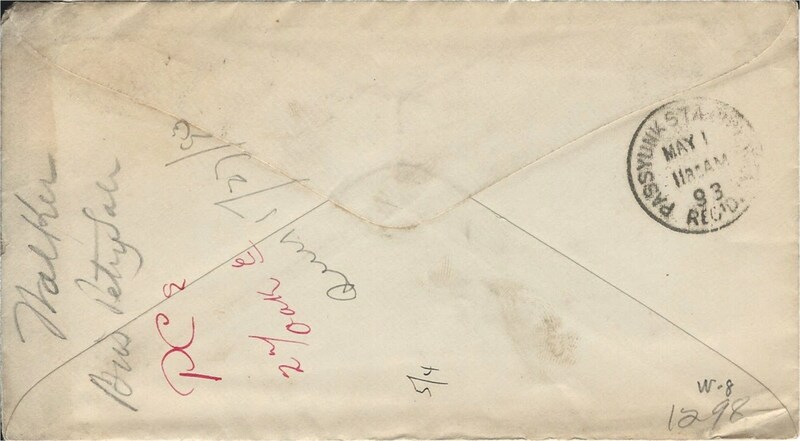 Backstamp "Received" May 1, 1893 11:30 A.M. Clarke No. 383 (See Part II. 15-16). the small 5/4 signifies the Chapman's replied to this bid sheet by May 4th. As you will note in Fig. 3 below the Chapman's queried Walters why he did not bid on more lots. Courtesy the Lupia Numismatic Library, Special Collection, The Chapman Family Archive. Fig. 4. Letter dated May 6, 1893 from Monroe F. Walters to the Chapman Brothers complaining about coin descriptions regarding condition or grading in coin auction catalogues not being true to objective eyes. A familiar complaint found among collectors and dealers reminiscent of the famous Cogan and Mason feud of 1868 to 1869 (q.v. sub Cogan). A second complaint about auction sales was losing a lot and becoming the under bidder by a fractional dollar amount such as a mere nickel. That is something frustrating indeed! However, that complaint is actually his own fault. Informed bidders give instructions to win to their bidding agents. So that if another nickel or more is required the agent is authorized to place a higher bid until the instructed cut off price or as the instruction may read, to win at any price. The remainder of the letter are discussions about four lots and his bids for the Chapman coin auction consigned by Nicholas Petry, to be sold May 10, 1893, just 4 days from the date of the letter. Courtesy the Lupia Numismatic Library, Special Collection, The Chapman Family Archive. S.H. & H. CHAPMAN, PHILA. PA. YOUR CARD RECEIVED THE REASON I DID NOT SEND MORE BIDS WAS BECAUSE I HAVE BEEN VERY BADLY DISAPPOINTED OF LATE AT AUCTION SALES COINS NOT COMING UP TO DESCRIPTION AND BY SOME OTHER FELLOW GETTING THE COINS I WANTED MOST BY FROM 5 TO 25 CENTS MORE THAN I BID. HOWEVER YOU CAN MAKE #308, 50 C HIGHER WOULD LIKE TO HAVE #375 AND YOU MAY BID UP TO $4.00 IF YOU THINK IT IS WORTH THE MONEY. $1.00 IS ALL I CAN STAND ON #436, WILL GIVE $1.00 FOR #625. PLEASE SEND ME PRICED CATALOGUE WILL SEND YOU POSTAL NOTE FOR SAME AS I CAN & GET TO THE P.O. His discussion of the bids are in conformity to the earlier letter dated May 1st above. These four lots are the ones he wanted most: (1) 1801 Eagle [Lot 308]; (4) 1795 1/2 Doll. VF [Lot 375 listed as Extremely Fine] willing to pay up to $4; (6) 1839 Doll 1/2 Unc. [Lots 436] only willing to pay $1 or twice face value; (7) 1802 Cent VF [Lot 625] willing to pay $1. He sold his coin collection of 451 lots containing fine Canadian coins, medals, jetons, U. S. coins, Colonial coins and numismatic literature and coin auction catalogues through Ed Frossard’s 127th Sale, on September 27, 1894. He remained an active numismatist his entire life. According to the 1900 U. S. Census, he and his wife had a boarder, Thomas W. Merry a superintendent of ore mines. His membership in the ANA lapsed and he rejoined in 1906 and was assigned member No. 812. In the 1930 U.S. Census he and his wife Lillian and their son Louis were living in Columbus, Ohio, where he worked as a janitor at Ohio State University since 1928 with an annual salary of $1,380.00. In the 1940 U. S. Census he worked as a supply man at Ohio State University. On May 10, 1943, at the 137th monthly meeting of the Columbus Numismatic Society he exhibited National Bank Notes of the First Charter Period. He died on October 27, 1948 one week before his 81st birthday and is buried in the New Lexington Cemetery, Perry County, Ohio. Frossard, Ed. CATALOGUE OF THE COLLECTION OF MONROE WALTERS. 127th SALE. New York, September 27, 1894. 25pp. 451 lots. 8vo. Original red paper covers. Durst 756; Adams 127; Gengerke 127. 1797 13 Stars, Dime, VF Estimated grade. Ex: Monroe F. Walters Collection; Edouard Frossard (originally described as Extra Fine); J. M. Clapp; Louis E. Eliasberg, Sr., Sold by Bowers & Merena, May 1996,Lot #1042 : price realized $2,200.